With just 34 years of grave plots left in Sydney, the local Muslim faith community has been handed a reprieve but is looking to Catholics for help. Source: The Daily Telegraph. Muslims, who have been laid to rest at Rookwood Cemetery near Granville since the mid-20th century, are facing a critical shortage of burial spaces. As a short-term solution, Rookwood General Cemeteries Reserve Trust has transferred to them a portion of land at Rookwood previously allocated to the Jews, following negotiations with the Jewish Board of Deputies and Lebanese Muslim Association (LMA). The trust has instead allocated new Lot 27 to the Jewish community and the Jewish section of Lot 10 to the Muslims. “For the first time in Rookwood’s history, these two communities have had the opportunity to work together to create two distinct interment grounds that reflect their end-of-life values,” the Rookwood trust’s chief executive, George Simpson, said. But even with the new allocation the Muslim community is expected to run out of burial spaces in Sydney within eight to 10 years, Mr Simpson warned. The Catholic Metropolitan Cemeteries Trust has offered up its own solution. They already manage a third of Rookwood and five cemeteries in western Sydney and look to build two more — one in Wallacia for 88,000 burial plots and another in Varroville, near Campbelltown, for 136,000. 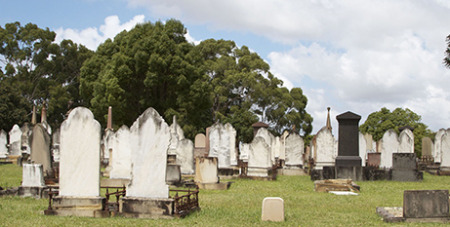 “We have made offers to both the Jewish and Muslim communities to provide sufficient burial space in western Sydney for the next 100 years,” the Catholic trust’s chief executive, Peter O’Meara, said. Deacon Ramen Youkhanis, of the Assyrian Church of the East, said his community needed the cemetery at Wallacia to proceed. “We have about 90 burial plots (of 500) left at (the Catholic trust’s) Kemps Creek cemetery,” Dr Youkhanis said. Assyrians also do no cremate. Both Kemps Creek and the Catholic trust’s Greendale cemetery, near Luddenham, are both expected to fill up in 20 years. Mr O’Meara has called on the NSW Government to address the development application process.